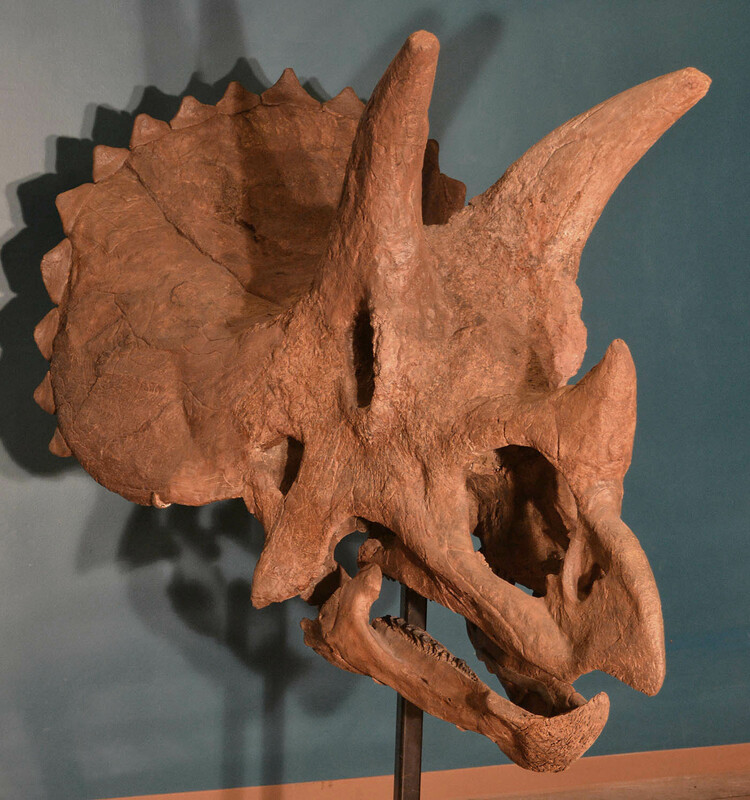 We're headed back out to excavate a few of the Triceratops sites that we discovered during our last expedition. We didn't waste any time in the lab though, and did a little bit of work on some of the specimens we brought back from or first trip. Jacob discovered a Triceratops femur in a channel lag deposit, directly downwind of a recently deceased cow carcass. It's now being fully prepared (and as it turns out, is only a partial specimen) as a touch bone for a museum opening soon. The turtle that I found the first day of the trip has now been identified as Stygiochelys estesi, with a distinctive scallop on the rear end of the carapace. 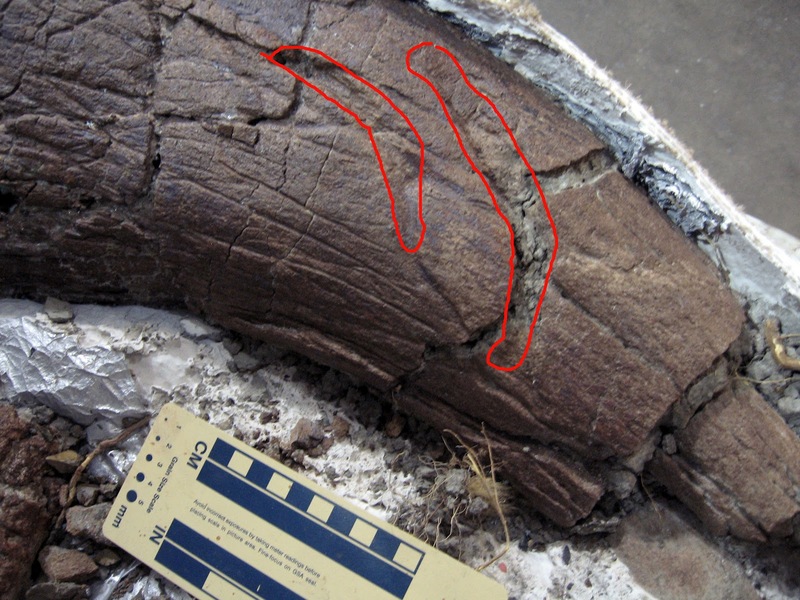 On the last day of the last trip I discovered the left brow horn and a few other bones of a large Triceratops prorsus.Preliminary preparation of the horn revealed two large and mostly parallel gouges near the distal end. These grooves have bone surface on the bottom and could be interpreted as healed bite marks from an attacking Tyrannosaurus rex. They definitely are not due to crushing or postmortem damage. Exciting stuff! I will update our progress again when we get back from our next trip. Hopefully we will be low on plaster and packed to the gills with fossils! First the good news: Ute pass is now open and so is the museum. Please stop by and visit! The bad news: The fire was pretty bad. 18,000 acres burned and 350 homes lost, along with 2 deaths. The fire impacted me personally by coming down the mountain and burning within just a few blocks of my home. I was certain for a while that the house was lost but the firefighters saved it in the end. I'm just back from a week evacuated out of the state. Previous to that, however, Jacob and I (and for a little while Mike too) were in South Dakota scouting for new dinosaur skeletons on a 2-week trip. We left most of the material in the ground for now, however we will probably recover many of the 7 dinosaurs that we located at a later date. A smattering of photos below for your enjoyment! Triceratops site discovered on our last day. Jacket is one brow horn.